A tiled surface should not be viewed as waterproof. 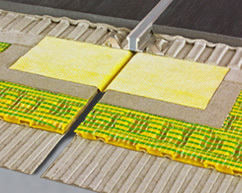 To protect substrates on walls and floors from water penetration it is important to provide secondary protection in the form of a barrier between the underside of the tiles and the substrate surface. This extra protection need only be provided in the area of exposure to water. The Dural Durabase system provides an easy to apply and cost effective way of providing this protection. In an average wet room it can be assumed that the area of maximum exposure to risk is in the immediate vicinity of the shower spray. Durabase WP should be applied to these areas. The membrane should be cut to size for the area allowing for an overlap on the seams of approx. 10cm. An adhesive suitable for the substrate should be applied to the wall. (Hydraulic setting tile adhesive is ideal for this purpose). The adhesive should be applied using a 4mm x 4mm notched trowel. The membrane should then be pressed firmly into the adhesive bed. A plastering trowel or the flat side of a notched trowel is ideal for this purpose. Trapped air bubbles must be avoided. 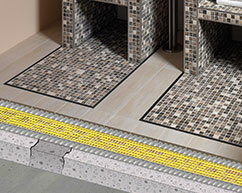 The transition from wall to floor must be bridged with a strip of WP membrane at least 5cm wide on each surface, (an accessory tape is available for this purpose or off cuts can be utilised where possible). 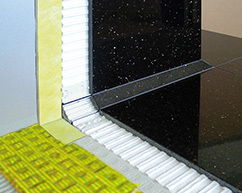 Tiling can commence immediately onto the surface of the membrane using standard methods and adhesives etc. In a wet room Durabase CI+ membrane can provide a solution to two problems. It provides protection from moisture penetration. It also absorbs any movement in the substrate. This would typically be either wooden boards or screed materials laid so as to achieve the falls in the surface to drains etc. This combination of benefits makes this product very useful in wet room situations. The membrane is laid into thin bed adhesive suitable for the substrate. In most cases this would be thin bed hydraulic setting tile adhesive. The sections are but jointed and the junction bridged with strips of WP matting as above. The junction of the wall and floor should also be bridged in the same manner. Where drains, pipes etc. must pass through the membrane these areas should be sealed with a “collar” made from WP matting. These are available as ready made items or can be produced from off cuts. Once the “tanking” has been completed and provision for drainage allowed for, tiling can commence. This should follow the normal working method. Durabase WP Sealing Membrane Thickness 1.5mm. Width 1.00mtr. Sealing Strip for junctions and transitions. Width 150mm. Sealing Strip for junctions and transitions. Width 120mm. Pre formed Corners Internal / External 140mm x 140mm. For further information please contact our sales office.